reading workshop. Before I get started, I want to be clear about what the writing station is NOT. My writing station is NOT a replacement for the shared writing and interactive writing that’s taking place in your classroom. And it’s definitely NOT meant to replace your Writing Workshop. As educators, it’s so important that we provide our students with many opportunities to write. My class wasn’t lacking opportunities to write, but I felt that they didn’t have enough choice. Shared and interactive writing are integral parts of the primary classroom but they aren’t always student driven. Writing Workshop provides a little bit more choice but only within the unit of study. For example, in kindergarten we spend the first half of the year working on narrative writing. My students just weren’t getting opportunities to explore different types of writing. I decided to create a writing station to provide choice and encourage creativity during our reading block. The writing station quickly became a staple in our classroom and has remained a favorite over the years. Here is a quick video that will give you an up close look at how I set it up. The vocabulary cards are attached to ribbon using clothespins, which makes it easy for students to take words on and off. I’ve stored my writing paper two different ways. The sterilite 3 drawer bins (seen in the video) are perfect to use if you have a table or shelf nearby. In my new classroom, I didn’t have any extra bookshelves so I purchased the yellow drawers and shelf (from Ikea) that can be seen in the first picture of this blog post. These have been working great and add a little pop of color to my room too! 🙂 I also like to have lots of different writing tools available at the writing station. Students can use pencils, markers, crayons, or colored pencils. It’s also helpful to have the alphabet or an alphabet chart nearby for students to reference. During our reading block, students engage in literacy stations while I teach guided reading groups. I set it up so that students visit the writing station 2-3 times a week. Students are encouraged to work on any type of writing they would like. The only rule is that they have to be working! After teaching expectations, I introduce the list paper. 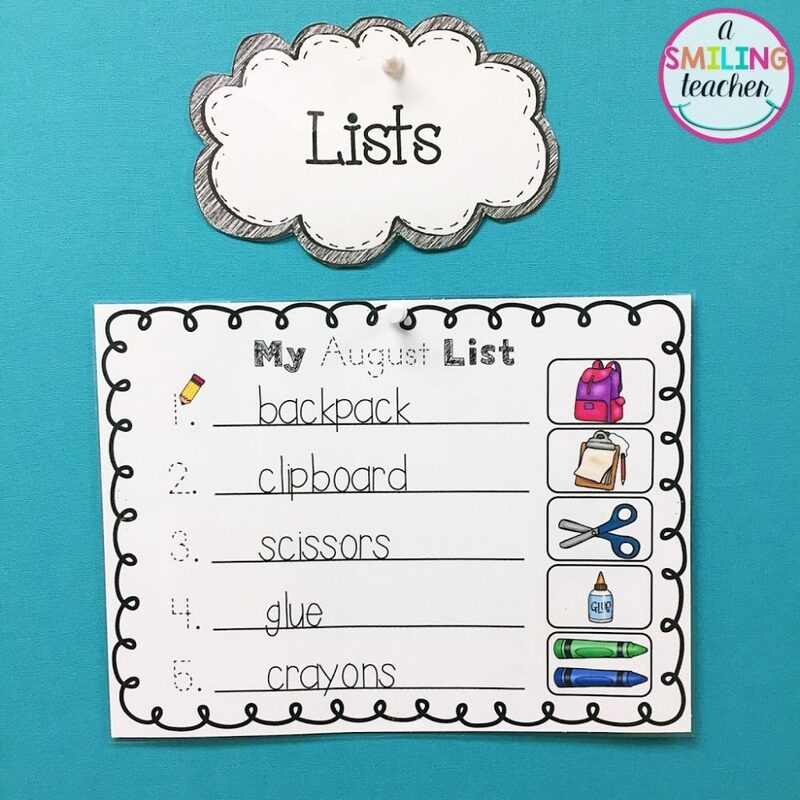 At the beginning, students often choose the same words that are on the list display poster, but as they become more confident, they choose different pictures and vocabulary. 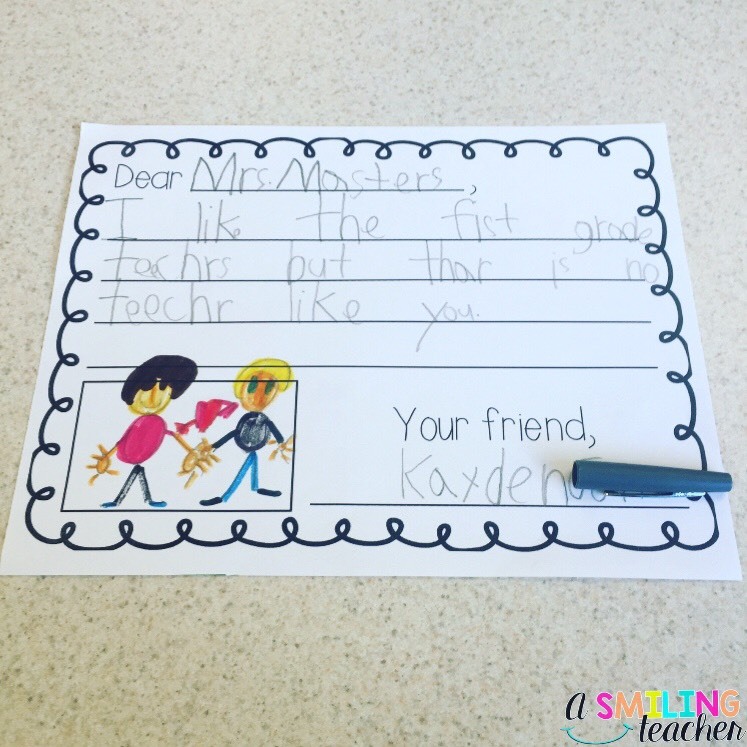 Students feel successful and can remember what they wrote because their pictures match their words. After a few opportunities practicing list writing, I introduce the story paper. We learn that we all have stories to tell and that we can tell them using pictures and words (which supports what we are working on in writing workshop). At the beginning of the year, I mostly see pictures and strands of letters. It’s OKAY, this is developmentally appropriate. I love being able to see their writing progress as the year goes on! The next writing that I introduce to my students is the labeling paper. 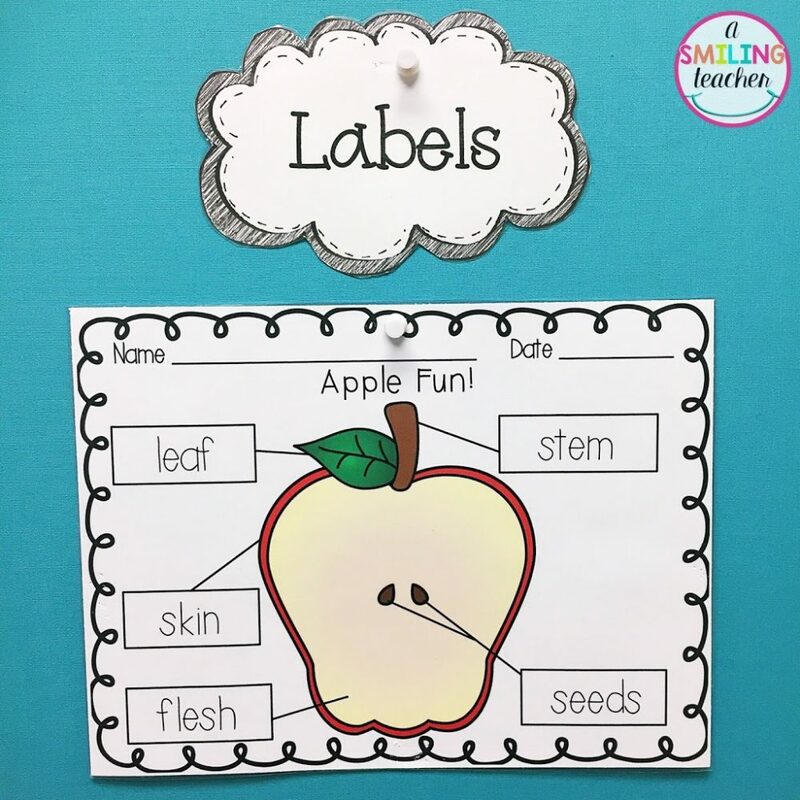 Labeling is such an important part of beginning writing and students LOVE having the opportunity to label different pictures. At the beginning of the year I display the labeling poster that has the words. Over time, I begin to display the blank labeling poster that is included in each writing pack. This is more challenging and requires students to either label it independently OR fill it in after they find the matching vocabulary card. 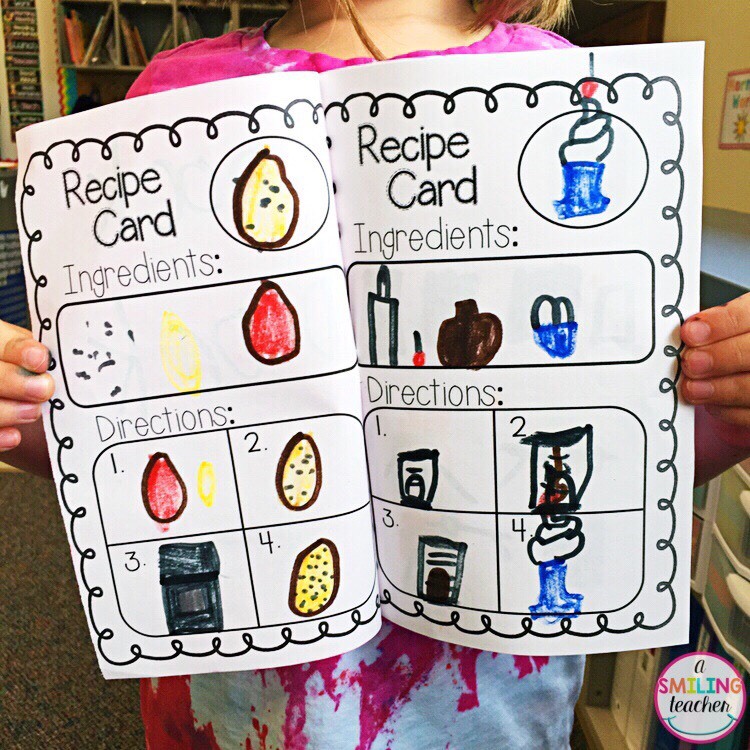 One of my student’s favorite choices at the writing station is the recipe cards. 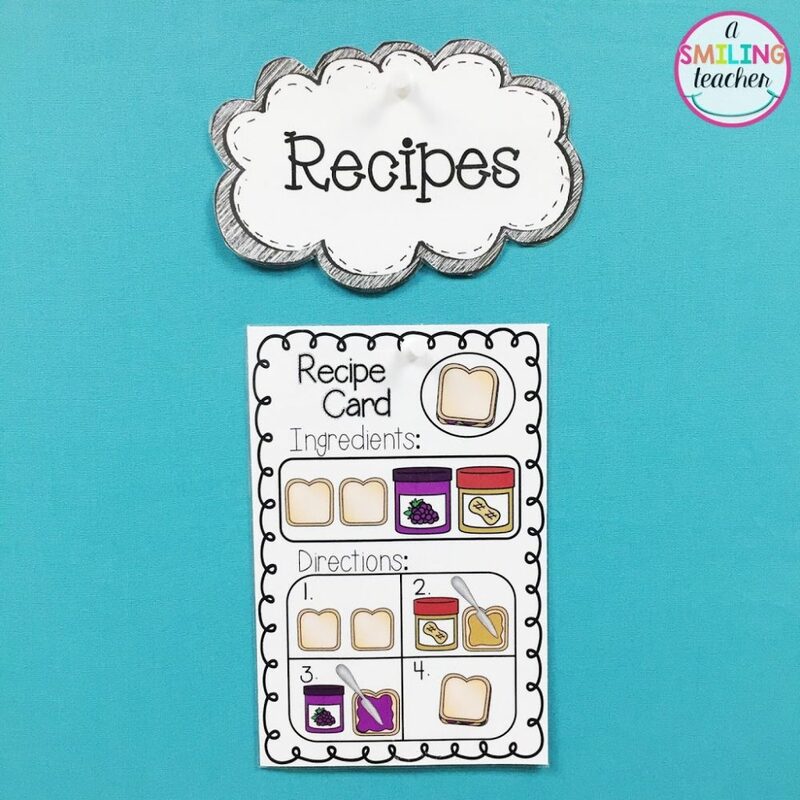 The recipe cards help my students think about providing information in a sequential order. During the second half of the year, one of our writing workshop units is informational writing. We spend time writing “teaching” or how-to stories. 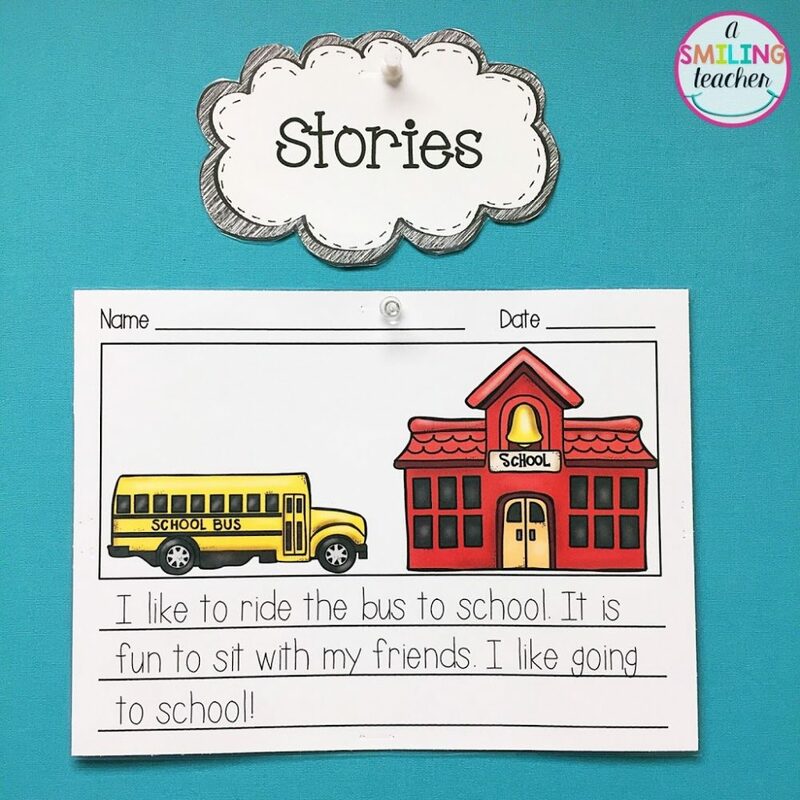 The recipe cards help prepare students for writing “teaching” stories because they’ve already had practice thinking about the steps in creating something. In fact, some students go on to make their very own cook books!! 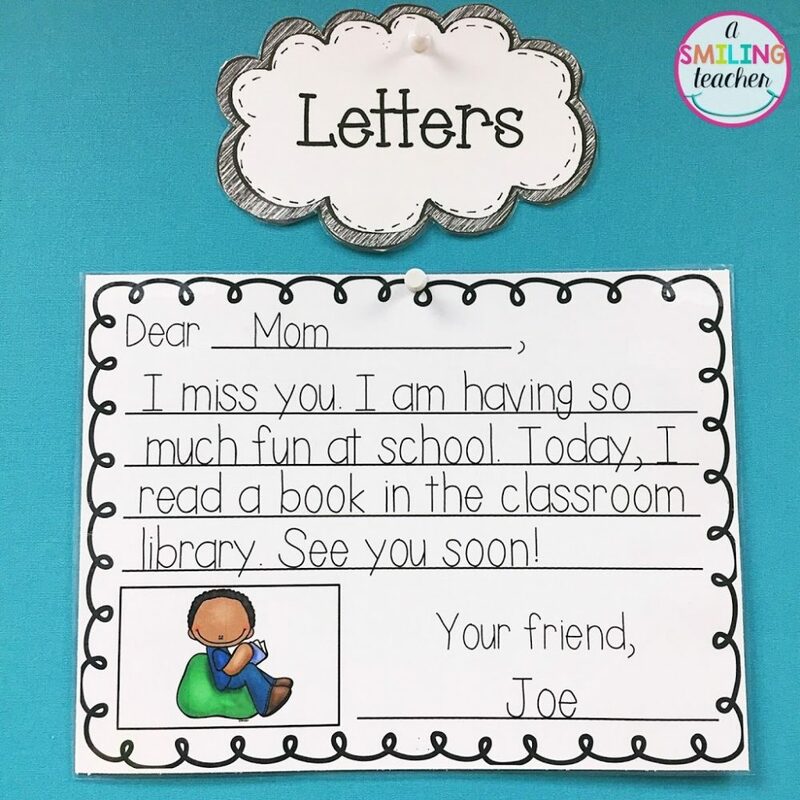 The last type of writing that I have available at the writing station is writing letters. 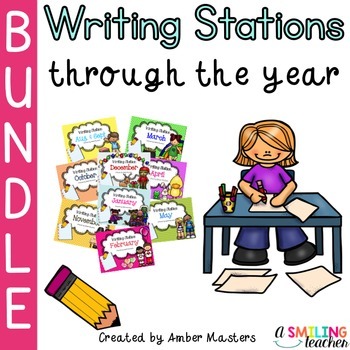 These writing stations are currently available on TPT in a year long bundle. All months are also available to purchase separately. Click the picture below to see this pack on TPT. 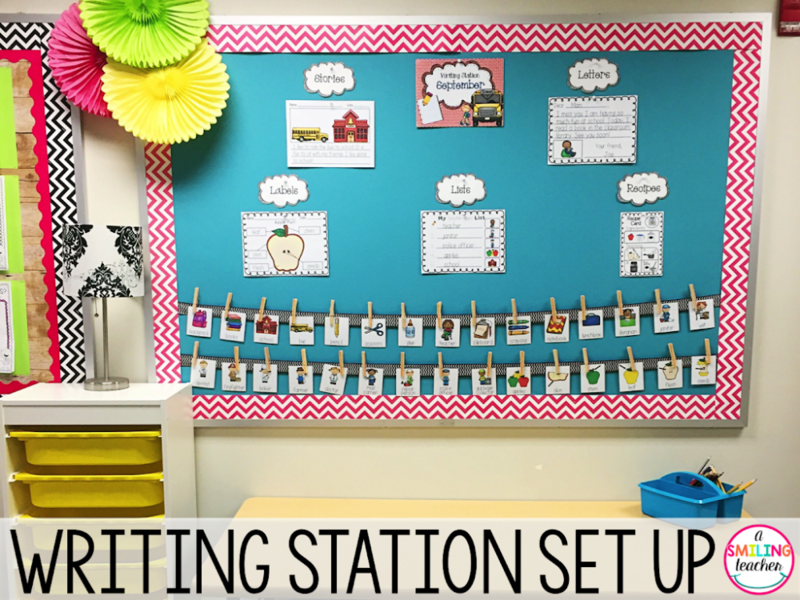 Thank you so much for stopping by and reading about my writing station set up! 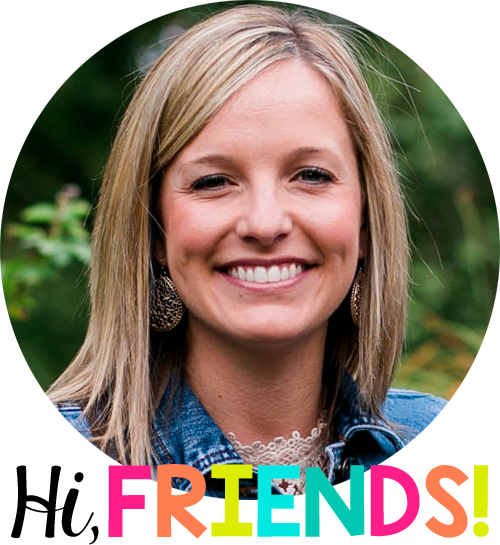 I’d love to hear how you create opportunities for writing in your classroom!